Mummy-Tips: Kids Gift Ideas Part 3 - Oops we shot the budget! Kids Gift Ideas Part 3 - Oops we shot the budget! I do realise that I am supposed to be sticking to a £10 budget with my kids gift guide and I do have lots more stuff to feature. But, we were sent this last week and it's so good that we had to feature it. I love Playmobil, it is one of those cool retro toys that have only got better with time. I used to love playing with it at school - but sadly never owned any my myself (sob sob). Being the fourth child my toys came in the form of hand me down Lego and soft toys that my mum brought home from her job as supervisor at Chad Valley. 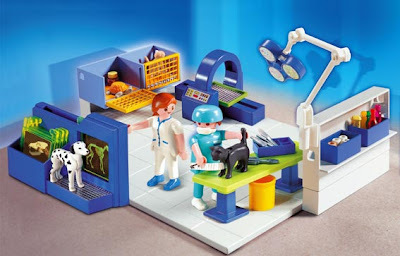 The cool set that we were playing with is the Vet's Operating Room. The attention to detail is genius - right down to the little plasters and bandages. In the crews rush to get stickers stuck and operations underway, they did manage to stick the x-ray stickers on upside down but that only added to their hilarity at the prospect of the tortoise having to go in with his legs in the air. This set isn't too pricey at £16.99 but it would make a great main pressie for one of your own children. My crew have had it out of the box everyday this week - even with the paddling pool calling from the garden. Our house is completely lacking in toys like this as they just haven't interested them in the past. FunnyGirl loves to play girlie doll games and enjoys the most entertaining imaginative play. ModelGirl loves making things and drawing and DinoBoy would, if we let him, be permanently attached to his DS / XBox / wii / iTouch. They do love their lego though, especially when big brother (18) lets them loose on his extensive collection but I can see that this won't be their last Playmobil set.